Well, another nice day in the office todayâ€¦ just finalised the last minute touches on our asset management system solution, that is due for a demo anytime now. very happy with the results so far. One of our clients has approached us about a month ago to develop a CHEP pallet management system for their organisation and now we demo it to them. As you can see, Its a web based pallet management system. the application if fully Ajaxified which makes it easy to use and operate. 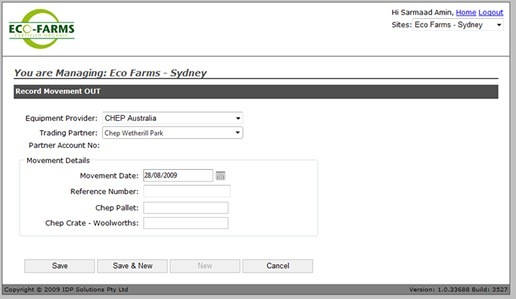 I have also included this screenshot from the site portal showing the process of sending pallets from Sydney location to another CHEP depo. this is by far one of the nicest applications I have ever worked on. it uses few different technologies and tools. We used Microsoft Queue Messaging System to place a job to generate the export files to sent to CHEP for invoicing and we used Telerik Reporting component to generate the report needed by management. well, this application might be up and running now, but we are working on some really nice dashboard tools the aim is to provide a way for the administrator to build their dashboard by selecting the type of chart and â€œplug-inâ€ the parameters to configure the chart. we are looking for examples of good Equipment management systems.